I’ve been lucky enough to go to India and the Himalayas (although Nepal, not Bhutan) and to see tigers in the wild. This book brought it all back to me. Even if you weren’t as lucky as me, I’m sure you will also be transported by Mr Guignard’s delightful and vivid descriptions of the scenery, the mountains, the animals, the people – and the school. Zoe narrates the story, but Zak is rarely far away, and makes his own notes on his mobile (or iParsnip, as my friend Blackbird would say) giving us his take on the situation. Zak is the sort of irritating boy that makes a great foil for a girl like Zoe (I speak from a girl’s perspective), and although often exasperating, he has a generous helping of all the best qualities. He certainly grows during this episode. I loved the pace of the story, the way it interweaves legends and stories that might just be genuine into a fantastic piece of fiction. I loved the little touches like the depressed flying carpet (oh, to have thought up something like that!) and the water shoes with gears. The trip up the side of the mountain, transferring from bus to truck to get past the landslides reminds me of some of my own long-forgotten adventures in mountainous areas. This is a wonderful third trip with Zoe & Zak, and their friends Tuk and Jill. It is full of excitement and spreads out a rich tapestry for our enjoyment. Fortunately it was only the Second Noble Truth that was being sought in this adventure – there are more yet to be found! I can’t wait. 5 stars from me (although I could do without the 4 chapter filler from the first book at the end). Terms and Conditions: NO PURCHASE NECESSARY TO ENTER OR WIN. VOID WHERE PROHIBITED BY LAW. The winners will be randomly drawn through the Rafflecopter widget and will be contacted by email within 48 hours after the giveaway ends. The winners will then have 72 hours to respond. If a winner does not respond within 72 hours, a new draw will take place for a new winner. Odds of winning will vary depending on the number of eligible entries received. This contest is in no way sponsored, endorsed or administered by, or associated with Facebook. This giveaway is sponsored by the author Lars Guignard and Fantastic Press and is hosted and managed by Renee from Mother Daughter Book Reviews. If you have any additional questions – feel free to send and email to Renee(at)MotherDaughterBookReviews(dot)com. I love your review, Jemima. I’ve recently read book 1 and the others are definitely on my radar. I’ll need to check out book 2 before this one. I confess I read the third book first, Steve – it’s a complete adventure in itself. I will go back and read the others though – and I’m looking forward to the fourth… and fifth! Thank you for your great review of Tiger Temple Jemima and for taking part in the tour. It’s good to know the third book stands alone – I read them from the start and I think it sucked me in even more as you watch Zoe and Zak grow. If you should go back and read the first two, you’ll really see how much Zak has grown as a character, in particular. Thank you for organising it all, Renee. I was interested in jumping in three books in to see how it works from my own point of view, of course. It’s an interesting experience. Love your review. How neat that you have been able to experience the areas in which this book is set! It sounds like a book my son might like to read. Thanks for visiting, Keitha. I’ll certainly recommend it to your son, it’s a great adventure! Sounds like a great series. I’ve never traveled to that part of the world, but my spouse has, and I’ve seen and read lots about it. Bet I’ll like it! You will, trust me. I recommend a local tour company especially for wildlife tours. I have the details of the people that took my group on the tiger trail. Well I was talking about liking the book! No plans to travel in that part of the world–we’re spending our savings next summer on a trip to Peru! The stars on Lake Titicaca are mind-boggling! Hi, Jemima. 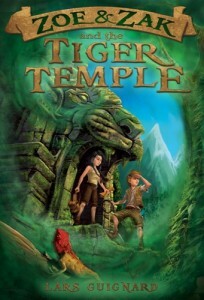 I’m glad the Tiger Temple brought some old haunts back to you. It’s always fun when that happens — like running into an old friend. Did you see in the news how there’s a man-eating tiger stalking Indian villagers? Wow. Anyhow, thanks for your thoughtful review! It was a delight, Lars, thank you! Sorry to hear about the villagers, I hope it all sorts itself out ok. I am really enjoying this series! It’s nice to be on the same blog tour as you! Thanks for sharing with the Kid Lit Blog Hop.